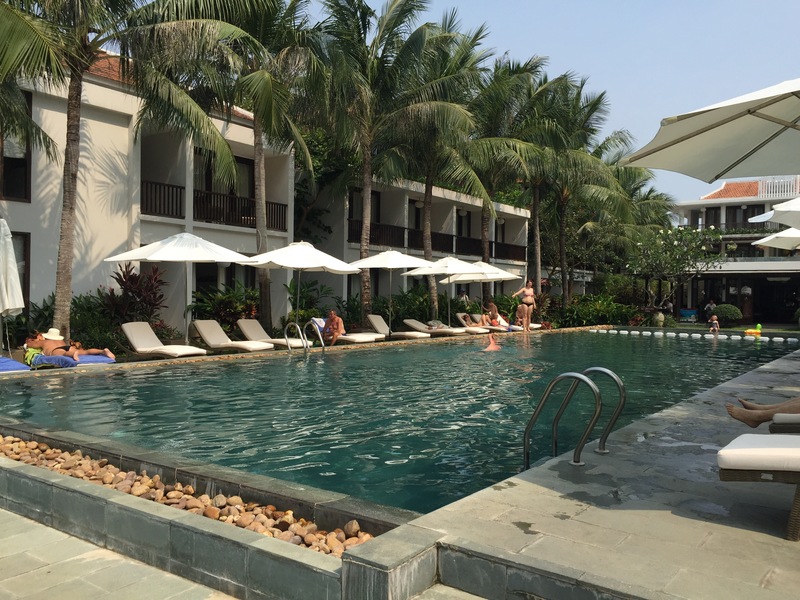 Before I get into the most exciting of our Vietnam posts (the hospital trip – spoiler: no one dies) I want to write a bit about our accommodation in Hoi An. I always enjoy looking at hotel photos and reading reviews and we enjoyed this hotel a lot and I’m sure I’ll want to pass on the details of our experience. 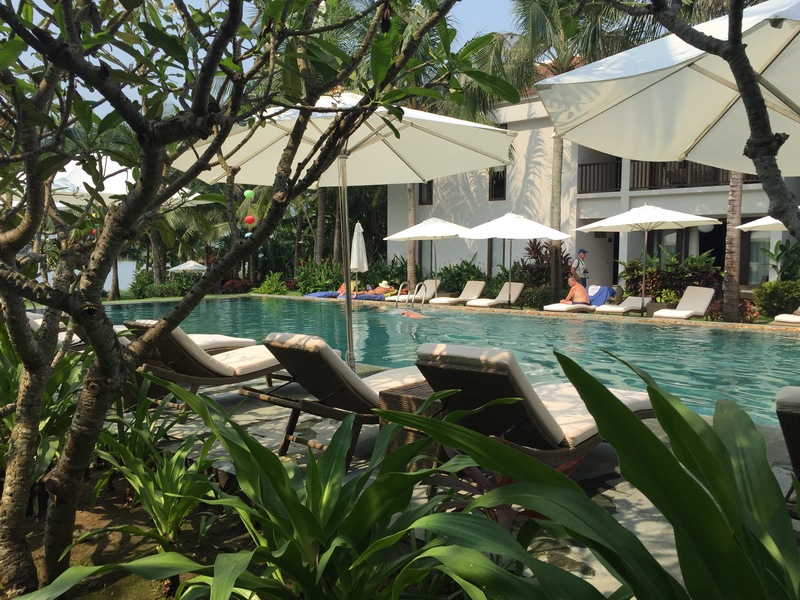 I found the Vin Hung Emerald Resort on TripAdvisor and had been tossing up between finding a place on the beach or in town. There’s serval kilometres inbetween and I’d only been to the beach for a few minutes the last time and it looked quite nice, plus all the beach hotels do free shuttles into town. However with the tailoring we wanted to do, and the fact that we were doing beaches in Thailand, staying in the old town seemed handier for more activities. 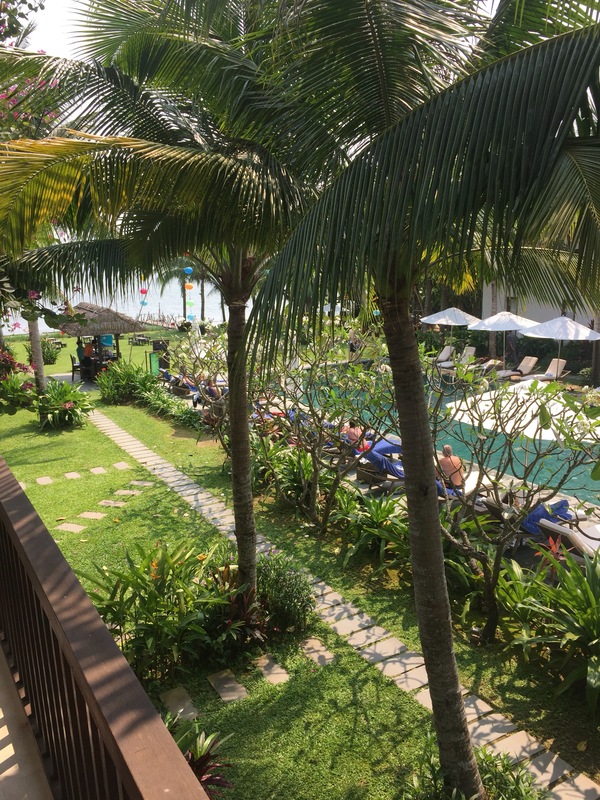 The Vin Hung Emerald had excellent reviews online, particularly with regards to the friendliness of staff, but googling the hotel was somewhat confusing as it turned out that there are five Vin Hung resorts and another is next door to the one we stayed at. We stayed at number 5, the one next door was 4. 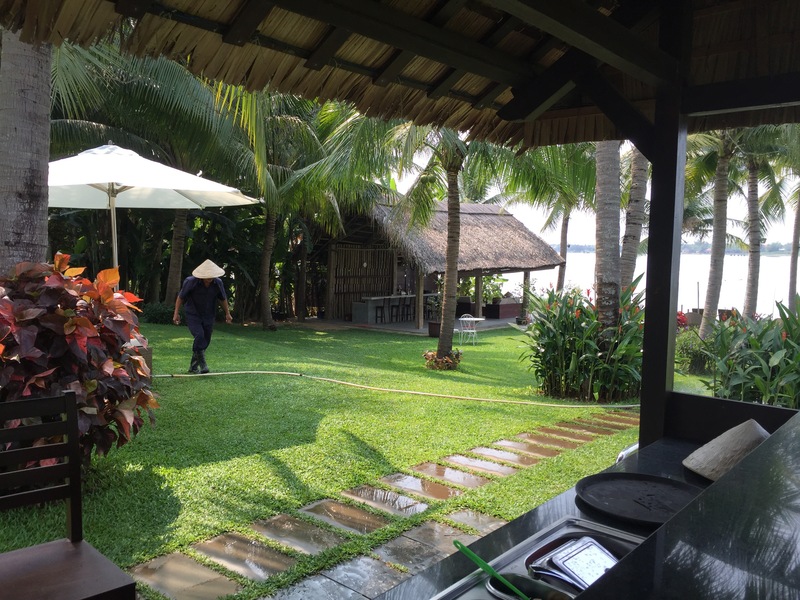 They are both situated on Hoi An island, on the bank of the river and a couple of blocks back from the busyness of the town. There is a mini mart across the road and several places in front that do a kilo of laundry for a dollar US, which is much cheaper than the hotel. I must also add that laundry done at Mrs Sa’s establishment comes back smelling like fruity sherbet, which was quite a treat. The hotel is arranged in a U shape that opens towards the river. The pool runs down the middle and there is a large lawn at the bottom with a bar down by the water. The river is quite busy, with boats going by frequently with tourists, fishermen, dredging equipment and all kinds of things. The water is definitely not swimmable! 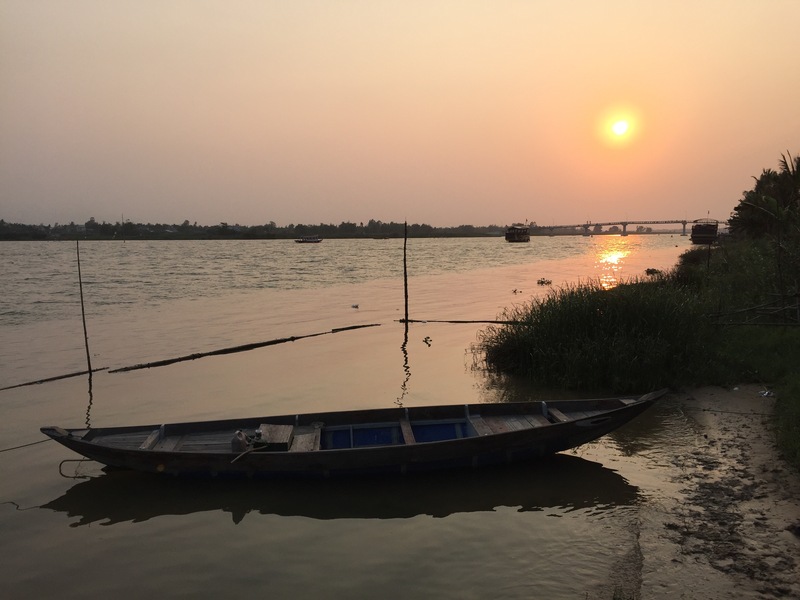 The sunset is visible from the river bar, and with the hazy Vietnamese sky, it can look very evocative. While the beds were as hard as any in Asia (excepting the thinly-veiled boards of our exceptionally basic bungalow in Koh Phanang), the rooms were very comfortable, although not as large as some resorts. Breakfast was included each day and was the usual substantial buffet most Asian resorts serve. I neglected to take photos but it was a mix of eastern and western food, both hot and cold. As we were all used to Australian time and were four hours ahead of local time, we were all waking early (Michael and Matt excepted due to late nights) so we were making it down to breakfast at 6am. The restaurant is bordered by a narrow pond that contained lotus flowers and thousands of tiny fish. One of the staff, Nu, told me that I could feed the fish with breadcrumbs, so every morning I saved some of my toast for them. Initially I wondered why they were all so small, but after hearing that the river floods almost every year, I understood. Poor fish! 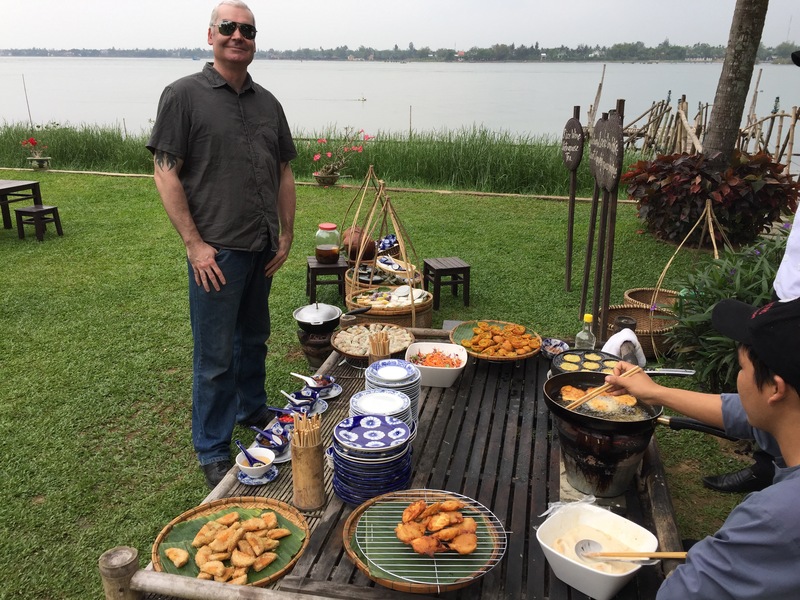 In the afternoons the hotel provided a taste of Vietnamese street food on the back lawn, so we’d gather at the bar and have a plate of snacks (going back to beg for more banana fritters) before heading into town for the evening. It was a very nice way to round off each afternoon. My final favorite thing about the resort was the abundance of flowers, particularly frangipani. Every morning the ground staff would sweep up all the fallen blossoms and the place smelled amazing. The contrast between day and night-time smells in Hoi An was astonishing. During the day it was petrol fumed, dank river water, cooking, animals and all the other strange odours. 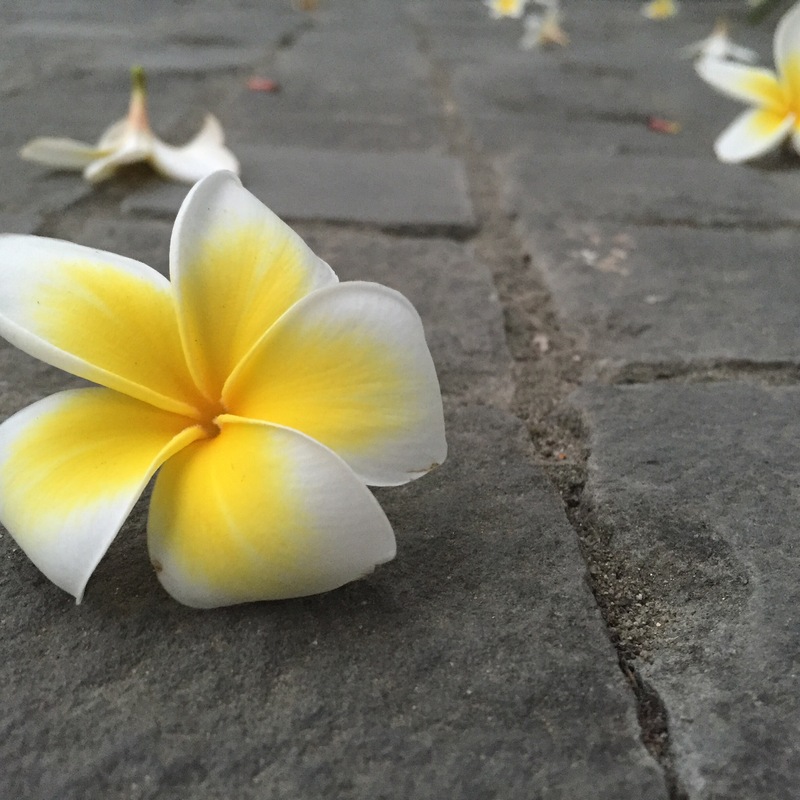 At night when the air cooled and stilled, the scent of gardenias and frangipani filled the air.